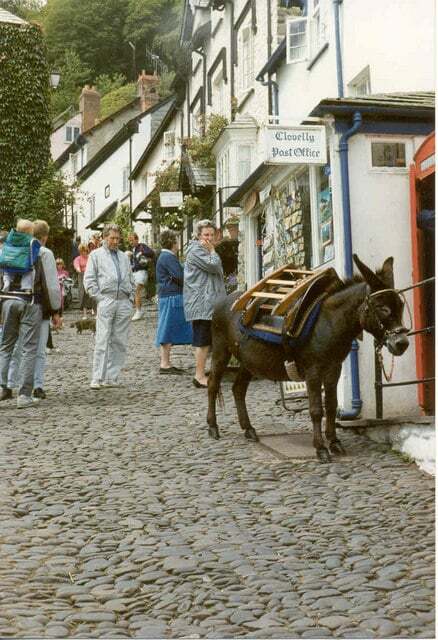 Clovelly is undoubtedly among the best known and probably best loved of Devon’s villages. Occupying as it does a dramatic cleft in the cliffs, the steeply cobbled village street lined by cottages clinging to the sides of the cliff, Clovelly is almost certainly unique. Residents and visitors alike will enjoy their visit to the village, but while there it is well worth taking the time to explore some of the sights and experiences that a local walk can bring. This walk explores some of the woodland which clothes the valleys and cliffs to the west of the village, as well as passing through attractive farmland and parkland and offering superb coastal views. Clovelly is on a regular bus service to Bude, Bideford and Barnstaple. The whole walk 8km/5 miles; 1 stile; 1 steep descent and 1 steep climb of about 100m/230 feet, 1 long steady climb of 80m/260 feet. Clovelly owes its existence to being the only safe haven on the north coast between Appledore on the Torridge estuary and Boscastle in Cornwall. It was mentioned in the Domesday Book and during Elizabethan times largely depended on herring fishing. This industry had almost disappeared by the 1820s, and then in the late 19th century the village was “discovered” as a destination for early tourists. It owes much of its unspoiled appearance to the local Estate, mostly owned since the 1730s by the Carys and then the Hamlyns. The Estate Company continues to ensure that the village retains its integrity. Clovelly’s parish church building largely dates from the 15th and 16th centuries. It includes a memorial to Charles Kingsley, the author famous for the “Water Babies” and “Westward Ho!”. His father was rector here. Note the walls round the churchyard, some of which date back to medieval times. Clovelly Court was built in the 1740s by the Carys. This contrasts with the early 20th century buildings at Court Farm, built in the “arts and crafts” style. Much of this valley woodland was planted in the early 19th century by the Hamlyns. Mouth Mill valley, one of the main wooded coastal valleys. The lichens may be seen on the trees here. The dominant tree is the sessile oak, which thrives in the mild damp climate but the rare Devon whitebeam is also present. The trees and lichens and associated wildlife have prompted the designation of these woodlands as part of a formal Site of Special Scientific Interest [SSSI]. Public use of the clear track leading to the coast and the access land has been made possible by an agreement with the landowner under the Countryside Stewardship scheme. Mouth Mill has some remains of lime kilns. Lime and poor quality coal was imported from South Wales and the lime burned in the kilns for fertiliser. It was then taken to the rural hinterland via the Mouth Mill valley. There are one or two good spots for views on the climb to the top, and the opportunity for a breather will be appreciated. 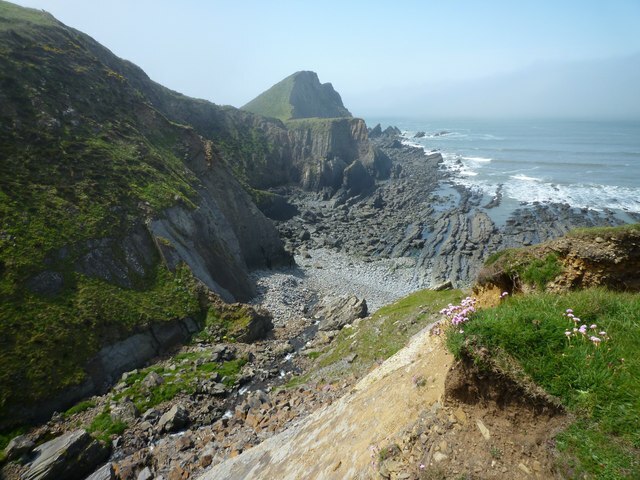 The viewpoints give the chance to look at the contorted geological strata in the cliffs, another reason for the area’s designation as an SSSI. There are various stories about the origin of the name of Gallantry Bower. One legend associated with the cliff is that loving couples forbidden to marry would jump from the top holding hands. The woodland and scrub at the top of Gallantry Bower has recently been cleared, restoring it to its earlier appearance. The view ahead along the coast is spectacular and extensive, stretching as far as Morte Point on a clear day. It also shows the stunted oaks growing on the sea cliffs, a further element in the SSSI here. Behind, Lundy shows clearly on the horizon. The shelter was built as long ago as 1826 as part of the Hamlyns’ landscaped park. It was thoroughly restored in the 1930s by Northam boat builders. There are many superb coastal view over Bideford Bay.